In an increasingly globalized world, the impacts of water-related decisions cross borders and affect everyone. Extreme events, environmental degradation, population growth, rapid urbanization, unsustainable and inequitable consumption patterns, conflicts and social unrest, and unprecedented migratory flows are among the interconnected pressures faced by humanity, often hitting those in vulnerable situations the hardest through their impacts on water.Addressing the inequalities faced by disadvantaged groups requires tailored solutions that take account of the day-to-day realities of people and communities in vulnerable situations. Properly designed and adequately implemented policies, efficient and appropriate use of financial resources, as well as evidence-based knowledge on water resources and water-related issues are also vital to eliminating inequalities in access to safe drinking water and sanitation. 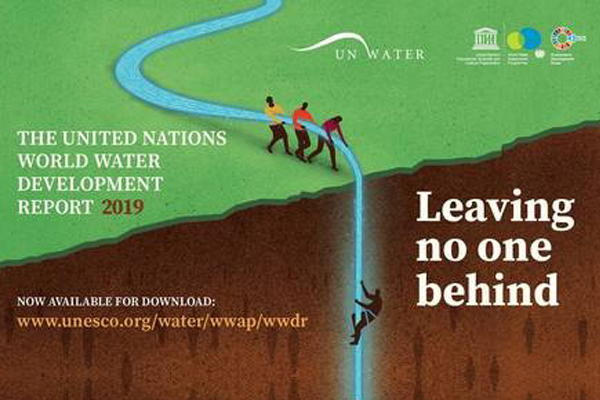 The 2019 World Water Development Report reinforces the commitments made by the UN member states in adopting the 2030 Agenda for Sustainable Development and in recognizing the human rights to safe drinking water and sanitation, both of which are essential for eradicating poverty and for building prosperous, peaceful societies. Improved water resources management and access to safe water and sanitation for all is essential for eradicating poverty, building peaceful and prosperous societies, and ensuring that ‘no one is left behind’ on the road towards sustainable development.